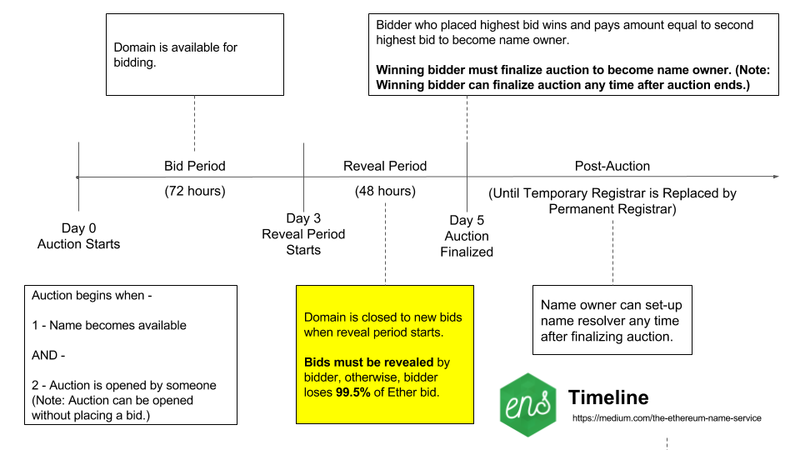 Still wondering how the Ethereum Name Service (ENS) bid process works? This visual timeline shows you each step of the process. The Ethereum Name Service (ENS) is live. It’s been running on the Ethereum Mainnet since May 4, 2017. This timeline is a visual guide to each step in the bid process. Check name availability by entering the name here. The earliest an auction can be started is on the day the name becomes available. An auction can be started any time after the day the name becomes available. Both criteria need to be satisfied for an auction to start. The rest of the bid clock starts ticking once the auction starts. The bid clock doesn’t start ticking until 1 August 2017. Additional bids can be placed for 72 hours after the auction starts. The bid period closes after 72 hours. Bids can’t be placed after the bid period closes. The reveal period starts 72 hours after the auction starts. It lasts for 48 hours. Anyone who placed a bid during the bid period MUST REVEAL THEIR BID DURING THE REVEAL PERIOD. THE BIDDER LOSES 99.5% OF THE BID PRICE, If a bid is not revealed during this period. The auction is finalized after the reveal period. The bidder who placed the highest REVEALED bid becomes the name owner. The name owner pays an amount equal to the SECOND HIGHEST BID to own the domain. Bidder C would become owner of thisname.eth and pay 2 ETH. The extra fund amount is the difference between the owner’s bid mask amount and actual winning amount. In this case the bid mask is refunded immediately and automatically after the reveal period ends. The current registrar is a temporary registrar. It will be replaced by the permanent registrar some time in the future. This specification explains the reasoning behind starting with a temporary registrar. Keep up with the latest developments in the ENS Gitter channel. Have questions? Ask them in the ENS Gitter channel.